You want me to stick it *where*?? 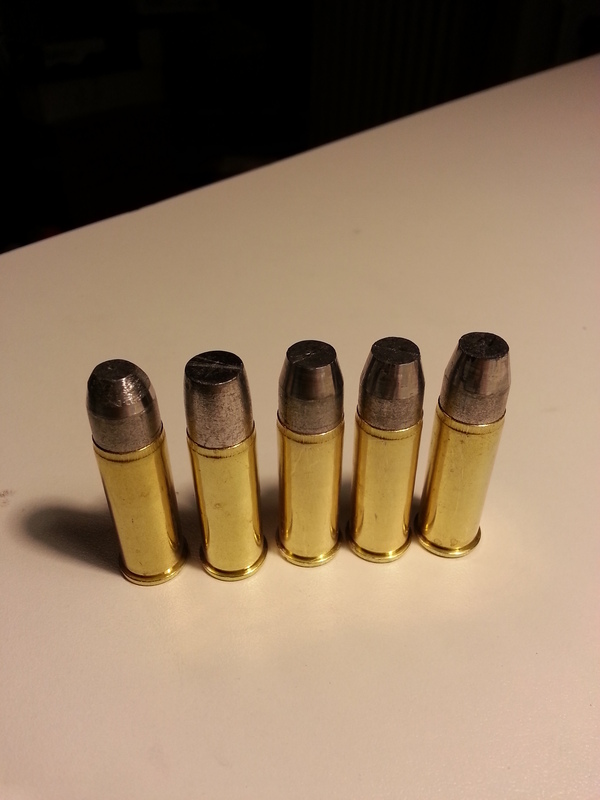 The beginning of this month, I posted an entry about my initial experiment altering one of those heavy Buffalo Bore 340gr +P+ rounds for .44 magnum. I intended to revisit that experiment in short order, and then write up further thoughts on the matter. But then my month got rather unexpectedly complicated, with my wife needing an emergency appendectomy, a lengthy hospital stay, and then a fair amount of additional care and treatment. She’s doing grand now, but most of the past month was a bit of a blur. So I’m just now getting back to the experiment. Fortunately, someone over on Facebook made a suggestion which proved to be just about perfect: use a pencil sharpener. Specifically, one designed for the larger style of carpenter’s pencils. The cartridge on the left is the one I initially altered using a rasp and then sandpaper. The one on the right is the one I used the pencil sharpener on. The sharpener itself is there — just one of those cheap plastic ones for schoolkids. If you look close you can see that the blades in it have a bit of rust on them. And the pile of shavings is what I took off the right cartridge. I’ve since done a full box of cartridges. When you get the hang of it, it only takes a couple minutes each. And the results are *very* satisfactory. They’re consistent. Smooth. Uniform. And I have carefully measured the shavings from each cartridge, and they all fall between 8 and 10 grains of lead removed. Most importantly, they all feed perfectly reliably in my Winchester 94 lever-action. So if you’ve encountered this problem, you might want to give this a try. You may need to experiment with a couple different sharpeners, and it’s possible that a different design one would work better for you (either an electric one or one that grinds off material rather than cutting it directly). But it’s worth a shot. And what sort of accuracy do you get? Accuracy is partly a function of every bullet being identical. So what are the chances you can shave off lead with a pencil sharpener and still have the bullets weigh very near the same? As noted in this blog post, I weighed the shavings for each bullet as I did them, and they all showed between 8 & 10 grains removed. The sharpener is surprisingly consistent. I have a Marlin 336 in 35 Remington with iron sights and with my eyes today it would be a lot worse than that! Although do better with an M1A (aperture open sights and enough distance to the front sight that I can actually get some focus on it). 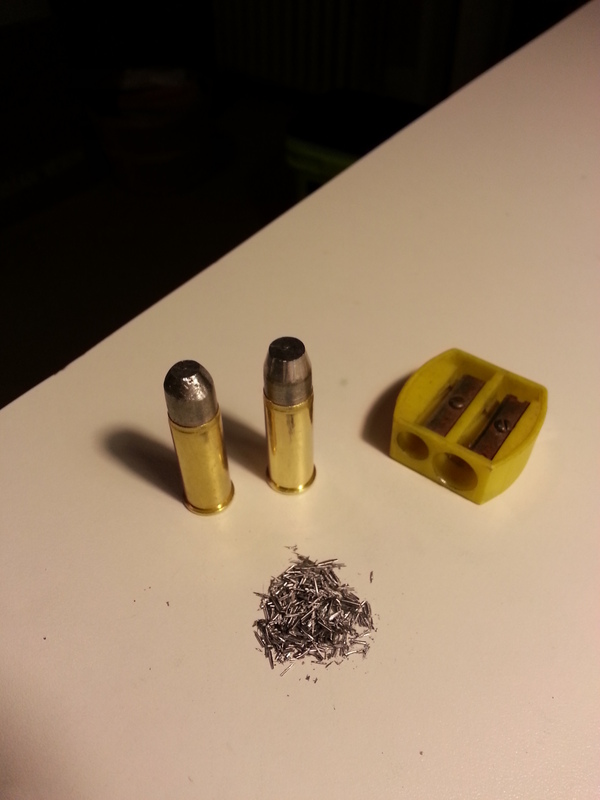 Now that I know that just changing the shape of the bullet a bit was all that is needed, I can probably go ahead and just load some overpressure rounds with the 330gr hardcast I mention in that blog post into .44mag cases, and call it good.